The BEST post workout or after school snack, these mini banana peanut butter sandwiches are drenched in chocolate and then frozen for a quick sweet treat that totally satisfies! Arrange the banana slices on a baking sheet lined with parchment. Spread a thin layer of peanut butter on half the slices and then top with the remaining banana slices. Transfer the baking sheet to the refrigerator. Place the chocolate in a microwave safe bowl and melt in the microwave in 30 second increments, stirring in between each, until smooth. 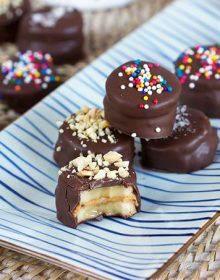 Remove the baking sheet from the refrigerator and dip a banana "sandwich" into the chocolate until completely coated and place on the baking sheet. Repeat until all bananas are coated. Decorate with sea salt, peanuts or sprinkles, if desired. Return the baking sheet to the refrigerator to set. OR for long term storage, transfer the baking sheet to the freezer for 30 minutes. If you're not eating all the banana bites the same day, be sure to freeze them so the bananas do not break down inside the chocolate. They can be stored in the freezer for up to 1 month.